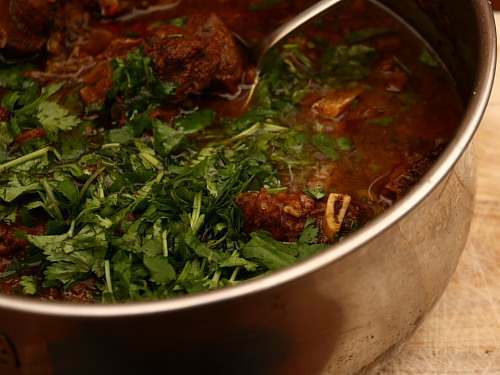 It stands to reason that curry goat is best made with goat, but goat meat can prove difficult to find. I scoured nearly every butcher I knew in the hope of finding it, from my normal, trusted shop right through to the tiny halal places in the back streets of Bradford. Nobody had goat. Nobody could get goat. Nobody could help me. I was about to give up and substitute lamb, which would have been OK, but nothing new, when I chanced across a Caribbean freezer shop in a market. I found out that, yes, they stocked goat, but they only get a delivery on a Monday, and that they were likely to have sold it all by Tuesday morning. If I wanted goat, I had to be there on Monday. This recipe is Hugh Fearnley-Whittinstall’s, and he describes how curry goat recipes differ wildly. Curry goat, it seems, is one of those things that no two people cook the same. The first thing to do is to pack the meat with some Caribbean flavours, and that means getting it into a spice mix and leaving it there for a long, long time. Dry fry a tablespoon each of coriander seeds, black peppercorns and fenugreek seeds together with twelve cardamom pods and a cinnamon stick in a frying pan without any oil until the spices start to gently brown. Use a coffee grinder or blender to grind the roasted spices to a fine powder and mix in a tablespoon each of ground ginger and turmeric. 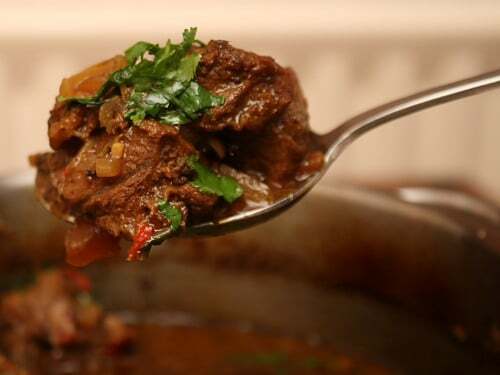 Put 2kg of goat meat, chopped into two or three centimetre chunks into a large bowl and add two generous tablespoons of the spice mix, three large, skinned and roughly chopped tomatoes, three cloves of chopped garlic, two finely chopped onions, the leaves from a small handful of thyme stalks and the chopped stems from a bunch of coriander. Add two tablespoons of HP Sauce to the bowl. Hugh hedges his bets here and lists this as optional, but I think the spicy and peppery kick that the HP gives is absolutely vital, aside from being, apparently, quite traditional. Curry goat needs heat. Lots of heat. The heat comes from a rather magical little chilli called the Scotch Bonnet. This is not a chilli to take lightly. Use it and handle it with care. It’s a vicious little fellow. One or maybe two Scotch Bonnets will be enough, seeded and finely chopped. Wash your hands thoroughly after chopping the chilli up, and don’t touch your eyes. If you do, you’ll know about it. Mix everything together very well – your hands should get very dirty and stained with turmeric – then cover the bowl and let it sit in the fridge for a day or so. When you’re ready to cook, heat some oil or clarified butter in a large frying pan and fry a few pieces of the meat at a time until they’re well browned. As you put the meat into the pan, scrape off as much of the marinade as possible. When the meat is all browned and you’re removed it to a casserole dish, tip the marinade into the same frying pan and cook it until the onions start to soften. Deglaze the pan with a little water and add the marinade to the meat. Add a teaspoon of salt and enough water to just cover the meat. Cover the casserole and put it into a low oven, 120c, for at least two hours, although don’t be surprised if it take three. The curry is cooked when the meat is tender and on the point of falling apart. Serve sprinkled with chopped coriander leaves and plain white rice. This recipe makes a huge pan full of curry goat. It gets better in the fridge overnight, and it freezes very well indeed. Nice! I remember the two times I've had goat curry – once in Hackney with these great deep-fried ball things (Jonnycakes, I want to call them?) and another was a Thai one in a Muslim area in the south of Thailand where they eat a lot of goat. Wonder if I can get goat meat here – there are a lot of goats, but maybe only for cheese. Their beady eyes scare me. If there are goats for cheese, there are goats for meat. If the female is used for milk production, you've got the problem of what to do with male offspring. Curry goat springs immediately to mind…. oooh this recipe sounds heavenly.. my mom always cook this during our family get togethers..next time i can make some for her:)thank you. Hmm… you're right. Now that I think about it, I've never seen goat in a market or butcher shop before! But I've never really looked for it either. I've actually only had goat once. Yours looks deeelicios.. well worth the search for the meat. Actually, it was me who was there at the market on the Monday buying the goat. It was a delicious curry though. This is true, it was you. But what were you doing in the market, anyway? Holy Yumminess!! My mouth is uncontrollably watering…thanks for sharing!! While no one makes curry goat as well as my mom, this recipe is a prety good attempt. I will have to give the recipe a try, but please do not tell my mom! This reminds me of when I was a student in Bradford in the 1970s. We were frequent visitors to pretty much all of the curry houses near the university, most of which were obviously Asian run. But one, Big Tony's, was Afro-Caribbean and every now and then the word would go round that Big Tony had taken delivery of a goat and those of us in the know would rush up before he ran out. I also ate quite a lot of goat some years later while working in Grenada, where I also tried mongoose for the only time; but that's a different subject. Which market was it, by the way? Big Tony wouldn't still be there, would he? The market was John Street, or whatever they're calling it these days…the Oastler Shopping Centre, I think. I almost sprayed my keyboard with coffee when I saw this recipe in my foodbuzz box, I had only yesterday been standing at a butcher counter looking at a goat leg, wanting to buy it, wanting it badly, but lacking any idea what to do with it once I got it home. Now I know! First of all, you found a butcher that sells goat…that's quite a find! 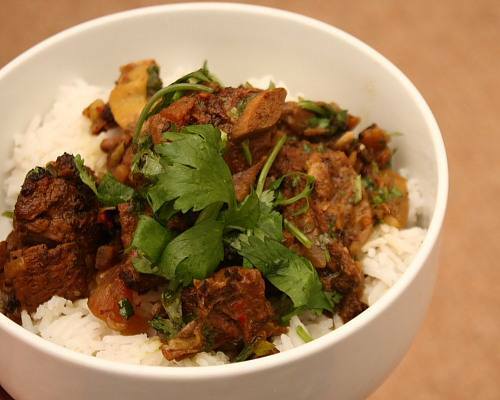 Secondly, whilst this curry goat is one of the more obvious recipes for goat meat, it's very well suited for use as a lamb substitute, particularly in Indian and Pakistani food. What kind of flavor does goat have? Can you compare it to anything? I love curry but know there is no way I could get goat in this small southern area. Fantastic looking dish you created. Thanks for sharing it. I love goat, it's such a healthy meat. A pity it's so hard for you to find though. Luckily it's not so hard here, especially at this time of year when all the lovely spring capretto is around! Looks like a deliciously flavoursome dish. wow that looks SO good… and we have a halal bucher that sells goat not far from us… im definitley going to try it! Rich (and for those living in or near Leeds), there's a large ethnic supermarket on Roundhay Road in Harehills at what used to be the Fforde Grene pub. Their butchers' section has fresh goat most of the time. BTW, the rest of the store is well worth exploring. btw, this is nothing like how we cook it in the Caribbean. I did see Hugh cook it on tv. He completely ignored how he was shown to cook it! But still, recipes can be changed and I am sure it tastes fine.